FG263200DGRN Color: Dark Green Features: -Double-ribbed base increases stability and dragging capacity. -Reinforced rims add strength and durability. -Built-in handles allow easy, non-slip lifting and anti-jam nesting. -All plastic construction will not rust, chip or peel; resists dents. -Rim features integrated rib structure to increase strength and resist crushing. -Stackable design enables nesting for easy transport and storage. Product Type: -Trash bin. Gallon Capacity: -32 Gallons. Shape: -Round. Application: -Indoor. Recycling Type: -Multi-Purpose. Room Use: -Garage. Primary Material: -Plastic. Dimensions: Overall Height - Top to Bottom: -27.25". Overall Width - Side to Side: -22". Overall Depth - Front to Back: -22". FG264356GRAY Color: Gray with "Indedible" Features: -Double-ribbed base increases stability and dragging capacity. -Reinforced rims add strength and durability. -Built-in handles allow easy, non-slip lifting and anti-jam nesting. -All plastic construction will not rust, chip or peel; resists dents. Product Type: -Trash bin. Gallon Capacity: -44 Gallons. Shape: -Round. Application: -Indoor. Recycling Type: -Multi-Purpose. Room Use: -Garage. Primary Material: -Plastic. Dimensions: Overall Height - Top to Bottom: -31.5". Overall Width - Side to Side: -24". Overall Depth - Front to Back: -24". 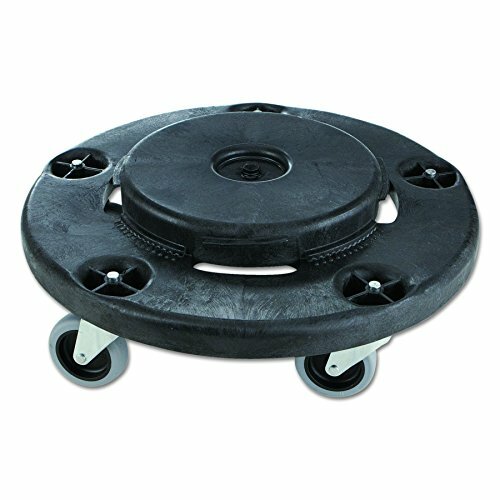 FG265500GRAY Color: Gray Features: -Double-ribbed base increases stability and dragging capacity. -Reinforced rims add strength and durability. -Built-in handles allow easy, non-slip lifting and anti-jam nesting. -All plastic construction will not rust, chip or peel; resists dents. -Rim features integrated rib structure to increase strength and resist crushing. -Seamless construction makes cleaning the container easier. Product Type: -Trash bin. Gallon Capacity: -55 Gallons. Shape: -Round. Application: -Indoor. Recycling Type: -Multi-Purpose. Room Use: -Garage. Primary Material: -Plastic. Dimensions: Overall Height - Top to Bottom: -33". Overall Width - Side to Side: -26.5". Overall Depth - Front to Back: -26.5". 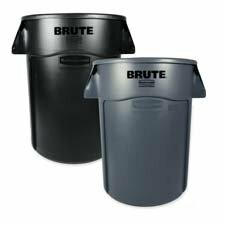 Rubbermaid Commercial Products Vented Brute Trash Can sets the standard for reliable garbage Collection in medium-to-high traffic areas. Built tough and versatile, these garbage cans feature revolutionary Venting channels that let air flow into the receptacle making liners up to 50 percent easier to remove. Integrated cinches allow bags to be attached to handles without knots for faster liner changes while contoured base handles and rounded top handles make it easier for staff to lift and transport these receptacles in any facility. Constructed of the highest quality materials, these crush-resistant garbage cans have heavy-duty, reinforced bases that hold up even when dragged across rough surfaces. These trash cans are stackable to save space and provide an unbeatable value with their easy-to-clean, seamless construction, UV inhibitor, and never fade, warp, crack, or crush guarantee. Meets NSF 2, 21 approval and is USDA meat and poultry Group listed, ensuring regulatory compliance for food storage and ability to be cleaned. 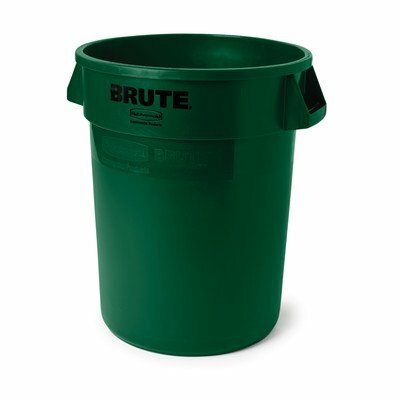 Rubbermaid Commercial FG264300DGRN Brute LLDPE 44-Gallon Trash Can without Lid, Legend. LLDPE has greater resistance to dents, cracks, punctures, and ultraviolet (UV) rays than low-density polyethylene (LDPE). 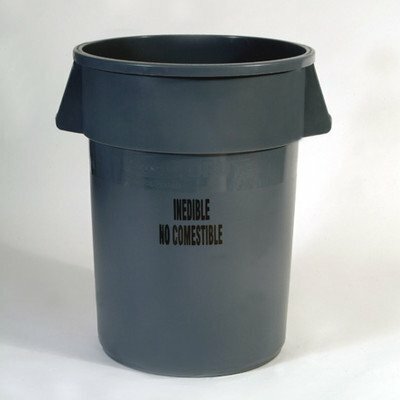 Round, linear low-density polyethylene (LLDPE) garbage can with a reinforced rim, non-slip handles, and a double-ribbed base. LLDPE has greater resistance to dents, cracks, punctures, and ultraviolet (UV) rays than low-density polyethylene (LDPE). 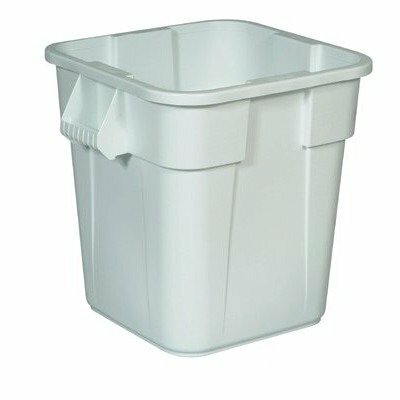 Trash can is injection-molded and great for nesting multiple containers without jamming when storing. Color: Dark Green. 44 Gallon. Seamless, polyethylene construction wont dent, rust or leak. Reinforced rim and base. Yellow, white and gray only are NSF/USDA Approved for food contact and NSF tested/certified. ~ 10-Gallon. Lid sold separately. 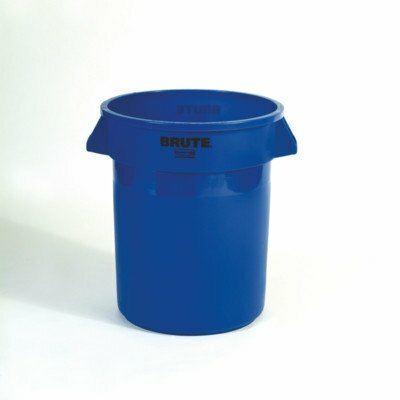 Flat lid for brute round receptacles - choose from 4 sizes.10-gal. and 20-gal. available in gray and white.32-gallon available in gray, white or yellow.55-gallon available in gray only. FG262000BLUE Color: Blue Features: -Double-ribbed base increases stability and dragging capacity. -Reinforced rims add strength and durability. -Built-in handles allow easy, non-slip lifting and anti-jam nesting. -Plastic construction will not rust, chip or peel; resists dents. Product Type: -Trash bin. Gallon Capacity: -20 Gallons. Shape: -Round. Application: -Indoor. Recycling Type: -Multi-Purpose. Room Use: -Garage. Primary Material: -Plastic. Dimensions: Overall Height - Top to Bottom: -22.88". Overall Width - Side to Side: -19.5". Overall Depth - Front to Back: -19.5". 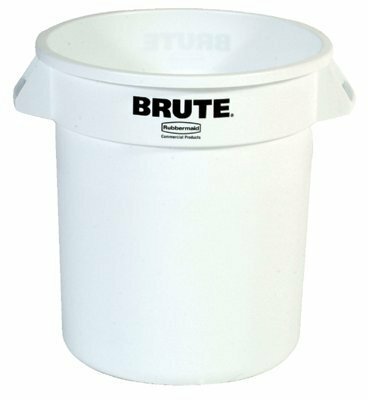 Rubbermaid Commercial Products BRUTE Trash Can, 32 Gallon sets the standard for reliable garbage collection in medium traffic areas. Built tough and versatile, these garbage cans feature revolutionary venting channels that let air flow into the receptacle making liners up to 50% easier to remove. Integrated cinches allow bags to be attached to handles without knots for faster liner changes while contoured base handles and rounded top handles make it easier to lift and transport these receptacles in any environment. Constructed of the highest quality materials, these crush-resistant garbage cans have heavy-duty, reinforced bases that hold up even when dragged across rough surfaces. These trash cans are stackable to save space and provide an unbeatable value with their easy-to-clean, seamless construction, UV inhibitor, and never fade, warp, crack, or crush guarantee. Meets NSF 2, 21 approval and is USDA Meat and Poultry Group listed for food storage and ability to be cleaned ensuring regulatory compliance. Waste Receptacle Type: Trash Container; Material(s): Plastic; Application: General Waste; Capacity (Volume): 32 gal. FG352600WHT Features: -Square shape offers up to 14pct more capacity than round containers.-Tight-fitting lids help protect dry goods and other contents.-Nesting handles allow secure fit for side-by-side use.-Testing and approvals:.-Certified to NSF Std. #2 and Std. #21.-USDA Meat & Poultry Equipment Group Listed and assist in complying with HACCP guidelines. Color/Finish: -Color: White. FG263200BLUE Color: Blue Features: -Double-ribbed base increases stability and dragging capacity. -Reinforced rims add strength and durability. -Built-in handles allow easy, non-slip lifting and anti-jam nesting. -All plastic construction will not rust, chip or peel; resists dents. -Rim features integrated rib structure to increase strength and resist crushing. -Stackable design enables nesting for easy transport and storage. Product Type: -Trash bin. Gallon Capacity: -32 Gallons. Shape: -Round. Application: -Indoor. Recycling Type: -Multi-Purpose. Room Use: -Garage. Primary Material: -Plastic. Dimensions: Overall Height - Top to Bottom: -27.25". Overall Width - Side to Side: -22". Overall Depth - Front to Back: -22". The Rubbermaid Commercial BRUTE Round Trash Can Lid fits Rubbermaid Commercial BRUTE trash cans (sold separately). 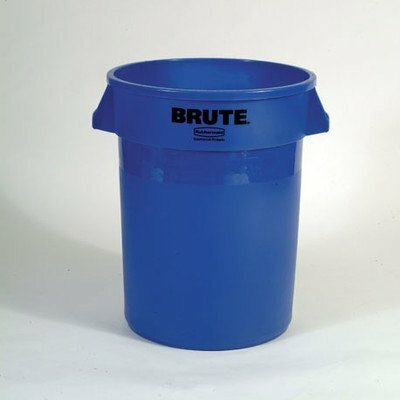 All-plastic, professional-grade trash can construction will not rust, chip, or peel, and resists dents. The strong, snap-on lids enable secure, stable stacking. Strong, snap-on lids provide secure, stable stacking. Made of durable plastic with molded handles. Lid features a strong, snap-on design for secure fit and safe handling. All-plastic, professional-grade construction will not rust, chip or peel and even resists dents. Self-draining channels prevent water from pooling, reducing still-water buildup. Flat design with ridges is stable for stacking. 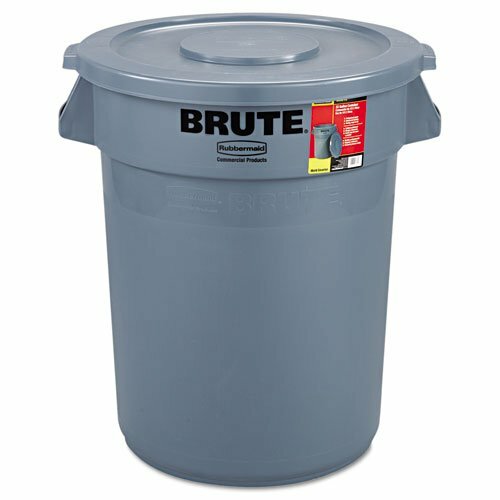 Lid fits Rubbermaid Brute 32-gallon containers (sold separately). 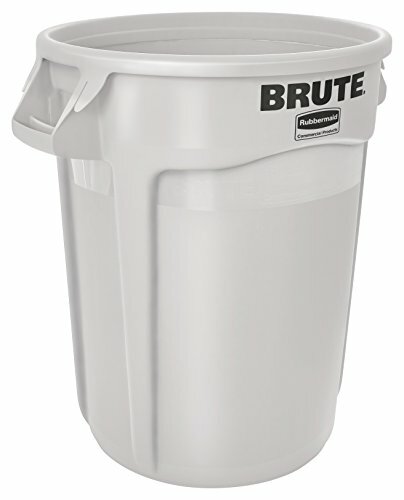 The Commercial Round Gray Rubbermaid Brute Lid for Waste Containers works well for 32-gallon garbage cans. It's made from durable plastic for protection against liquids and other messy trash. This plastic container lid includes molded handles that are compatible with other Rubbermaid products. Put this Brute in your corner. Large-capacity receptacle makes great sense for both mobile-materials collection and centralized-bin stations. All-plastic commercial-grade construction. Rust-, chip- and peel-proof. Dent-resistant. 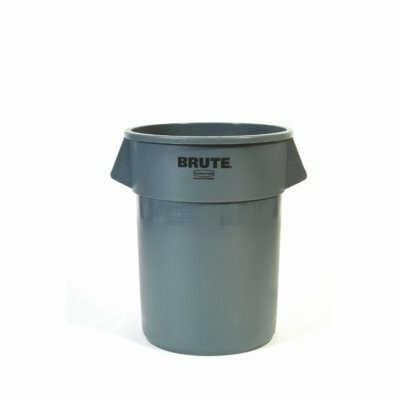 Rubbermaid Commercial Products Vented BRUTE Trash Can, 44 Gallon sets the standard for reliable garbage collection in high traffic areas. Built tough and versatile, these garbage cans feature revolutionary venting channels that let air flow into the receptacle making liners up to 50% easier to remove. 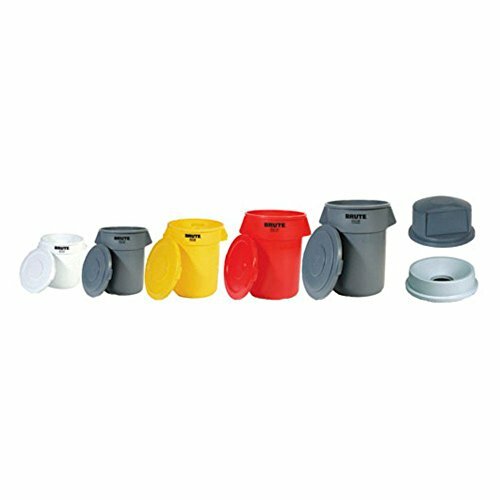 Integrated cinches allow bags to be attached to handles without knots for faster liner changes while contoured base handles and rounded top handles make it easier for staff to lift and transport these receptacles in any facility. Constructed of the highest quality materials, these crush-resistant garbage cans have heavy-duty, reinforced bases that hold up even when dragged across rough surfaces. These trash cans are stackable to save space and provide an unbeatable value with their easy-to-clean, seamless construction, UV inhibitor, and never fade, warp, crack, or crush guarantee. Meets NSF 2, 21 approval and is USDA Meat and Poultry Group listed, ensuring regulatory compliance for food storage and ability to be cleaned. 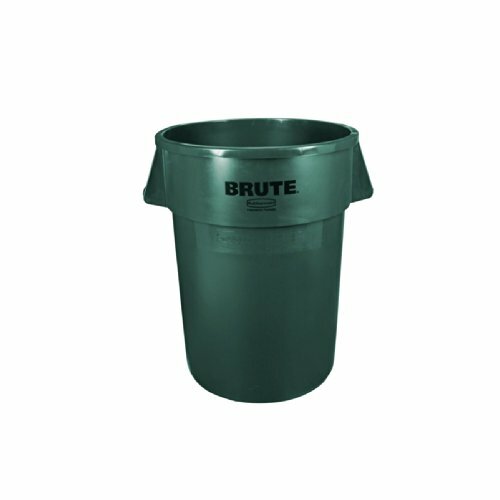 Rubbermaid Commercial Products Vented BRUTE Trash Can is built tough and versatile with revolutionary venting channels that let air flow into the receptacle making liners up to 50 percent easier to remove. Integrated cinches allow bags to be attached to handles without knots for fast liner changes while contoured base handles and rounded top handles make it easier for staff to lift and transport these receptacles in any facility. Constructed of the highest quality materials, these crush-resistant garbage cans have heavy-duty, reinforced bases that hold up even when dragged across rough surfaces. These trash cans are stackable to save space and provide an unbeatable value with their easy-to-clean, seamless construction, UV inhibitor and never fade, warp, crack or crush guarantee. Meets NSF 2, 21 approval and is USDA Meat and Poultry Group listed, ensuring regulatory compliance for food storage and ability to be cleaned.